September, the perfect time of the year for studying our galaxy. Wait a minute – don’t you need gigantic telescopes and space rockets and satellites and things to do that? Well, no, you just need a pair of eyes and a little patience. Let’s have a go. First requirement is a dark sky. The Sun sets at five to eight at the start of the month but is as early as a quarter to seven by the end, crossing the celestial equator at half past three on the 22nd (the Autumnal Equinox to you and I). It doesn’t get properly dark for an hour or so after sunset when twilight ends but before that you will be able to see the brightest planet at the moment, Mars. It’s quite low now, just west of south but still quite obvious. To the right of it you should see Saturn sitting above the star Antares and, as the days go by, Mars will slowly move away from them. The Moon needs to be out of the way too. It is new on the 1st and reaches first quarter on the 10th, so for the first week of the month we should be OK. It passes close to the planets on the 8th and 9th and that is something that is always worth looking out for. Full Moon is on the 18th so do take notice of just how much of the sky it washes out and you’ll see why astronomers curse this phase. After this, darker skies should start to return so now you need a good dark viewing location. There are still quite a few to be found around Alvechurch but my favourite spot at the bottom of Scarfield Hill has been ruined by the dreadful illumination of the new station. Thanks a lot, London Midland! Now it takes around twenty minutes or so for your eyes to fully adapt to the darkness but you can start looking immediately and notice how much more is revealed as you observe. Start by facing south and looking straight up. There is the brightest star, Vega. To the left is Deneb and below them is Altair, and these three form a giant triangle in the sky known as the Summer Triangle. If you concentrate on Deneb, you’ll see a mist around it that streams down towards Altair and upwards over the sky towards the “W” of Cassiopeia. It will start to get lost in the lights of Birmingham in this direction but on a good clear night, it will extend quite a way down. You can see why it is called the Milky Way but this band of thin fog is, in fact, the light from the billions of stars that make up our galaxy, which are too distant to be seen individually. Down below Altair is the galactic centre but it can’t be seen because it is shrouded in inter-stellar dust which obscures the view in this direction. You might even see evidence of this dust halfway down the Summer Triangle where it appears to create a divide in the misty starlight. So, get out there and gorge on a skyfull of Milky Way. 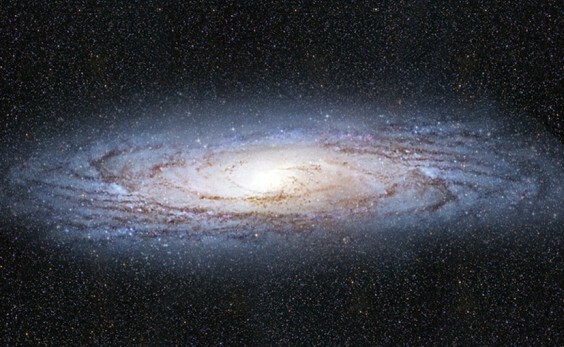 Above: How our galaxy might look from 100,000 light years away.